Is this a breakfast or is this a dessert? Or maybe it’s a breakfast parfait or a dessert parfait. A parfait partay! Yes, I’m a little excited because… chocolate and double chocolate. This recipe actually started as a kid friendly double chocolate muffin, then it morphed into a healthy double chocolate muffin. Suddenly it also became a double chocolate baked donut recipe. I love these kinds of recipes where you can make it in any form. You could probably even frost them and call them a cupcake in a pinch. Meh, I’ll stick with muffins and donuts though since they make me happy. For the original recipe, I used all purpose flour but I’ve been on a white wheat kick lately so I used that instead here. Preheat oven to 400 degrees and place 14 paper cupcake liners in a muffin pan or spray a donut pan with non-stick spray. Measure and combine the dry ingredients (through salt) in a large bowl. Make a well in the center and add in the wet ingredients. Mix well. Add the chocolate chips to the batter and stir to combine. Divide the batter into the prepared muffin or donut pan, filling each hole about 2/3 of the way full. Bake at 400 degrees for 15 minutes for muffins and 9-10 minutes for donuts. Remove from oven and cool. 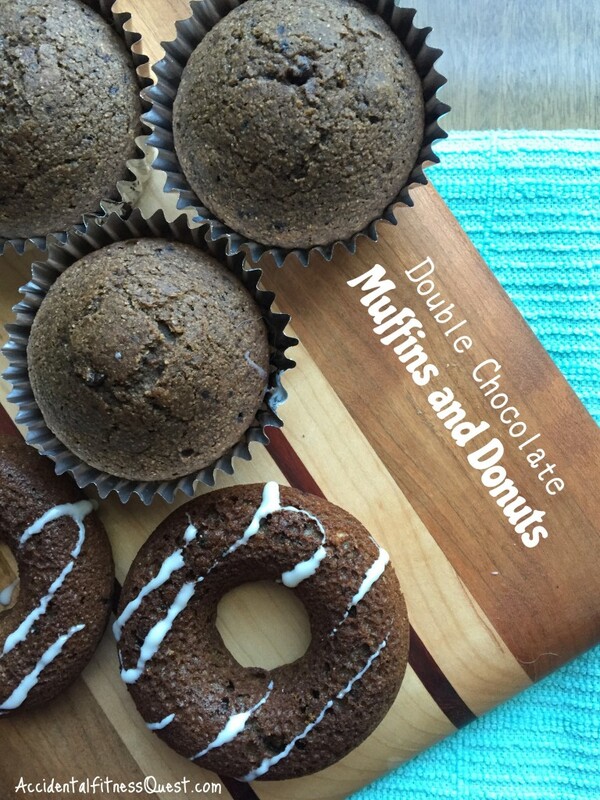 Makes 14 muffins or donuts at approximately 132 calories each – 3g protein, 21g carbs, and 4g fat. Drizzle glaze on your donuts and dip them in coffee. Crumble them and layer with greek yogurt (or ice cream) and berries to make a parfait. Eat them straight up. I love them in all the ways! If you’re looking for more baked donuts, try the tiramisu donuts or the power cakes donuts. Both of those are good too and layer well with these babies. If you’re interested in working with me to get meals together fast while working towards your health goals, I’d love to chat. Drop me an email, or come on over to Facebook and ask a question. You can also contact me and tell me more about your dream goal.